The opposite of disgruntled has to be gruntled (at least, as far as I can tell) – I was thinking of this and trying to make myself gruntled. Can you just do that? Sort of like “making yourself” a blogger. You accept where and what you are and choose to make the best of it. Yea! – That again … because in the next couple weeks or so– unless I do something to completely screw it up – I should hit the blogging milestone of 1000 followers. So I made a chart to show what it feels like to be at this cusp of greatness! It means that this little minnow of a blog has grown up to be a medium size and completely legal sport fish in this bizarre world. If you hook into this blog, you can expect a nice little tussle on the end of the line and a good picture to take before you release me back in the water. So many little minnow blogs never grow up and make it – and that is sad. Half the blogs that follow me probably don’t exist anymore – and that is sad. Sad because all you have to do is keep posting until you find your voice. You do, and you will find it if you keep posting. So thanks for staying with me through all the rants, photos, drawings and not-quite-legal music captures. It means a ton to hit this milestone even if half of you are already gone. Come back and try again. There are no rules saying you can’t – most of us fail miserably the first time – this blog is my second attempt after 6 months with a horrible one and 3 followers. Thanks for making me a respectable sized fish in this web ocean. I really do enjoy each like, follow, and comment. Even if I may appear a tad snarky and disgruntled at times. Congrats on the 1000. Blogging is as much fun as teaching. Where else are you gonna get a couple of people (half a class or one billionth of the blogosphere) listening to you? Don’t stop. I’m gonna pause my Pandora ambient channel and listen to Trio interpret Neil (top shelf voices/words) and an oh-so-retro David, more maybe. Thanks for that opportunity and for the like. Thanks much – I counted a couple chickens before they hatched as I still need 4 more to make it over the hump. 🙂 I better get back to blogging! Ha ha. Fun post. I like that: keep blogging ’til you find your voice. Yours is easy, sincere, and fun. Thanks very much! 🙂 … everyone can become a good blogger – most quit too soon. I’ll quit over my dead body. LoL. Cheers! Congrats and all that goes with this. Interesting post to me…see my post from today and you will understand…maybe even reply! I like gruntled! Thanks for the invite and I did stop on by. 🙂 I have to get out more. Congrats on the milestone! Awesome! 🙂 Blog on! 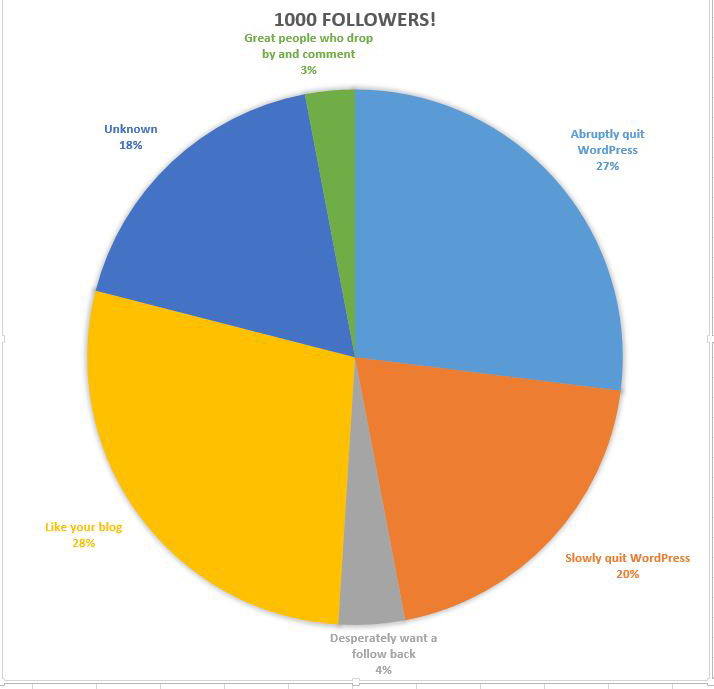 I definitely consider you a 3%’er on my site Wayne, nice pie chart summary! If you can be disgruntled and full of remorse, can you be gruntled and full of morse ? Thanks for dropping by my Implied Spaces blog. Congrats on your almost milestone, Wayne! Thanks very much – I better get there now! Thanks, and thanks for being a 3%’er!